Bartering has been around as long as people have. Before the exchange of money for goods and services, people would trade for the necessities of life. I’ll give you my basket of apples for your basket of potatoes. I’ll trade you some of my grain for that load of wood you chopped. The exchange of currency for goods and services may be simpler but bartering has never really disappeared. For example, prisoners commonly use cigarettes as currency to get protection or extra food because that’s all they have to work with and kids transact lunch-box trades every day. The value of something is relative. The kid who gets cookies every day might crave the cream-filled cupcake of his friend and be willing to trade more of his lunch for it. As in all bartering, the ideal situation is when each party gets something they consider more valuable than the thing they’re giving away. The recent economic downturn made bartering a popular undertaking again for both businesses and individuals and bartering websites have been popping up. You list the items and/or services you have to trade along with the thing or service you want to acquire and wait for someone with what you need to reply. Barter Network Ltd., or BNL, was set up to help businesses trade goods and services. They trade everything from printing services and advertising spots to hotel stays, assisted in each transaction by a bartering broker. The website makes money by charging businesses a one-time fee to join, along with a five percent fee for each transaction and monthly maintenance and trade fees of $10 each. For individuals, Craig’s List and Kijji’s bartering sections are good places to start, as people are already comfortable with buying and selling on those websites and it costs you nothing but your time. You can trade virtually any thing or any service; for example, singing lessons for housekeeping services or carpet cleaning services for a flat screen TV. Trading with someone seems simple enough but there are a few basic rules to keep in mind. Think of all of the skills and possessions you would be willing to trade and list everything. There’s a greater chance of getting a favorable response . Stay safe. When meeting for an exchange, have someone you know go with you and meet in a public place. Don’t let someone coax you into trading something you don’t want to trade and don’t barter for something you really don’t want. Be prepared to just walk away. People may try to offer services that don’t quite seem on the level. If you wouldn’t pay them for it, don’t barter with them for it, either. There are no guarantees when bartering. You can turn something on to make sure it works but, even if it starts up, you still can’t be sure that a laptop doesn’t have a dying battery. You can’t blame the other party for a bad trade. The choice to barter was yours and, just as you can make a bad decision when making a retail purchase, it can happen when you barter, as well. Bartering gave way to currency because it could be just plain impractical at times, taking a lot of time and work to find someone who wanted what you had to offer who also had what you needed. Even today, trying to decide on what constitutes a fair trade can be problematic. For those reasons, bartering probably isn’t for everyone but trading for what you need could be the solution when you find yourself short of cash. There is nothing like a home cooked meal in exchange for some good manual labor. Wow what a great piece! 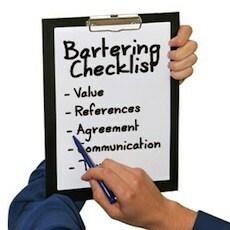 I use barter all the time, I trade with ITEX Barter in Toronto. They always have great purchase opportunities and I sell what I want, when I want, it’s such a great tool for me. You can check them out at http://www.creativebarter.ca and you’ll see what a great organization they are. I’ve sold so much and purchased vacations, business equipment, things for my home, appliances, residential and office furniture and more. I really recommend them!